A pizza pan with holes is usually referred to as a perforated pizza pan, and it is identified by several tiny holes along the bottom of the pan. While the holes might not look like anything special, they allow heat to reach the entire crust as it bakes, which results in a crispier pizza crust. If you use the perforated pizza pan to make a thin-crust pizza, you'll not only get a crispy crust, but you'll also reduce the overall calorie count compared to pies made with traditional or deep-dish crusts. Spray your perforated pizza pan with nonstick cooking spray, or rub the surface of the pan with a thin layer of cooking oil, such as olive or canola oil. These types of oil boost the nutritional value of your pizza because they contain unsaturated fats, which are good for your heart. Roll your pizza dough out into a thin layer or to your desired thickness. Sprinkle the dough and your rolling pin with flour to help prevent the dough from sticking. Consider making your dough with whole-wheat flour because it's higher in dietary fiber, which encourages normal digestion and could lower your risk of heart disease. Lay the rolled out pizza crust on the pizza pan, keeping the edges on the pan. Don't let the crust hang over the edges of the pan because they will cook more quickly than the rest of the crust, which could result in burning. 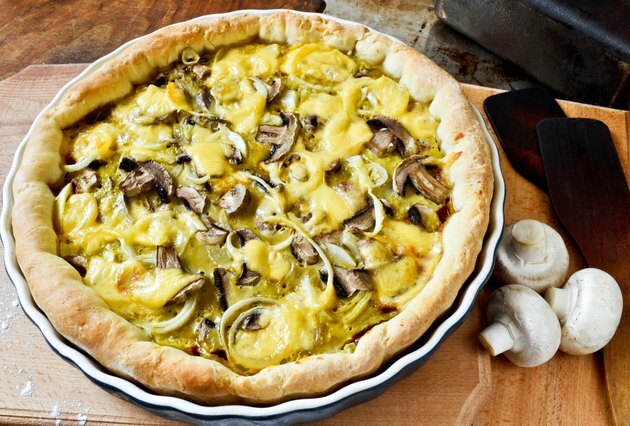 Bake the pizza crust according to the recipe directions, and top it with your favorite toppings. Reduced-sodium pizza sauce, low-fat cheese, turkey meat, tomatoes, black olives, spinach, artichoke hearts, bell peppers, mushrooms, onions and pineapple are healthy toppings that will increase the nutritional value of your pizza. Heat leftover pizza on your perforated pizza pan. Lay the cold pizza on the pan and bake it in your oven until the slices are hot. Using the perforated pizza pan will achieve a crispy reheated crust, which isn't always possible using a microwave or traditional baking sheet. Sprinkle your pizza crust with fresh or dried herbs before topping it with sauce and other ingredients. The herbs will boost both the nutritional value and the flavor of your pie a small amount. If you're using your perforated pizza pan to make a lower-calorie thin-crust pizza, don't negate that effort by topping your pie with fatty pepperoni, sausage and other unhealthy ingredients.